Five years ago local musician Gillian Snider branched out from the secure world of choral music to start a serious and loving relationship with jazz. 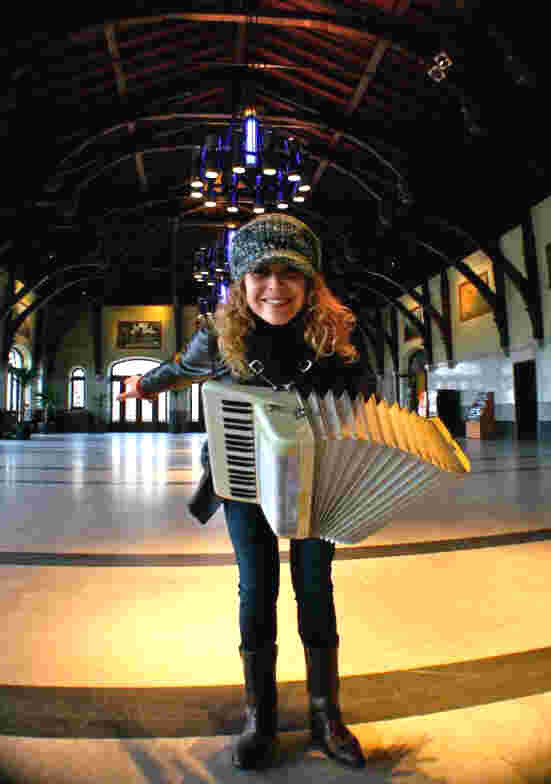 She has entertained across Canada from Saskatoon to Quebec City, playing house concerts, cafes and raucous bars. She continues to perform with musicians she loves, from classical repertoire and jazz to grass roots and gypsy/kletzmer thrash. Now Gillian brings her smoky jazz vocals and accordion to the Boomtown stage. Maurice, Wayne, and Doug are The Paddlewheelers. This trio from Saskatoon entertains audiences with guitar music from the 20’s, 30’s and beyond, including original work as well. Each has been playing for over ten years. James Steele is a Saskatoon fiddler who has been performing for the last ten years. He is a Five Time Saskatchewan Champion and Two Time Grand Champion. James was recently honoured to be asked to represent Saskatchewan at the Canadian Fiddle Grand Masters. Lionel Gilbertson is one of the finest accompanists in the province. He joins James on piano. The Prairie Spirit West Jazz Band is made up of students from the communities of Delisle, Vanscoy, Asquith, Perdue, and Borden. These students are in grade 8 -12, and meet together once a week to rehearse as a group. They have become a very busy performing group over the past few years, performing for a wide variety of community & school functions. A highlight for our students came last spring when we were given an opportunity to perform at MusicFest Canada, a national music festival, in Markham, Ontario.